Just to say how pleased that we are with the work that you did on the SLK, you made a 14 year old car look like new! We are recommending you to all our friends and hope to see you soon to do the BMW. Just wanted to say thanks to you and Bill for an excellent job on my Wife's Mini and my Quaschi today. You offer a very professional and friendly service and I will definitely recommend you to anyone who needs any work done on their car. I am writing to say how pleased I am with your service. The repairs to my car were undertaken speedily and efficiently and I am delighted with the result. I would happily recommend you to others. Thank you Tony & Bill for the amazing repair to my car – I had caused quite a bit of damage to the car’s wheel arch and rear door and really didn’t think it was something that could be repaired on my driveway, I was so pleased with the finished work. You were professional, polite, arrived on time - being able to carry out the ... Read more repair on a Saturday was a great bonus too – no need to take time off work. Thank you too for removing an additional dent near the door handle – I had been advised by a body shop it wasn’t possible to remove it so that was a great bonus. The cost of the work was all agreed before starting so no hidden costs and I paid a fraction of the price quoted by a body shop. I would have absolutely no hesitation in recommending you 10 out of 10 for professionalism and standard of work. Tony, Chips Away, filled and repaired two sensor holes in the rear bumper, excellent results, finish was blemish free. I would have no hesitation in recommending Tony / Chips Away. I would definitely use Tony again. I have never had to use a scratch repair company before and whilst I was unwilling to pay main dealer prices for a whole new bumper and repspray, I was a little nervous about having work done to my Range Rover Sport. I need not have worried. Tony Costello in Kent was fantastic - easy to book and even texted to advise when he would ... Read more be arriving to carry out the work. Quality of the work was amazing - from filling and smoothing out deep scracthes to the blending so that it matched the rest of the bumper. I would have no hesitation in recommending him or, if I am clumsy again (! ), to have him come to do more repairs. Thanks Tony. Thank you very much for the superb repair work on our Honda (30/5/15). Good as new. Professional service from start to finish. We have no hesitation in recommending you to family and friends. Tony was brilliant!!! I contacted chips away as I had scratched our new car's black alloy. I didn't want my partner to find out so needed it fixing quickly. Tony managed to squeeze me in the very day and did a fantastic job!! You wouldn't even notice that a repair had been done. Hopefully I won't do it again but if I do I would not hesitate on contacting ChipsAway again. Brilliant. The communication between ChipsAway & myself was good. I was given 4/5 options of dates to chose from that were convenient to me. 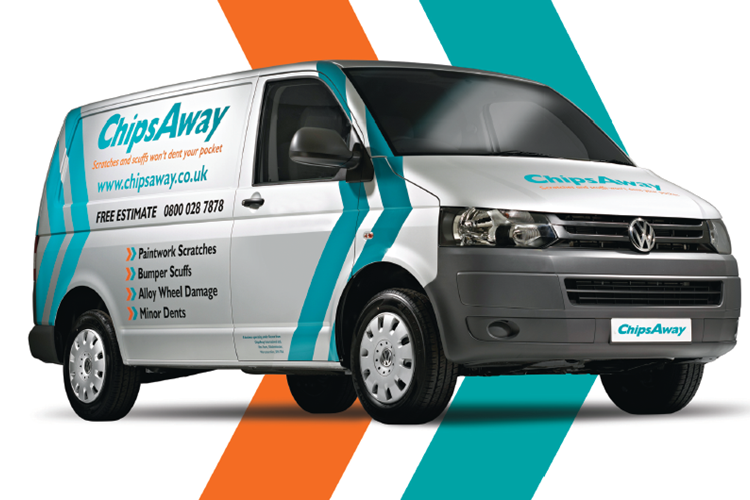 The standard of work was extremely high and I would highly recommend ChipsAway to do a no fuss, top class job. I would like to thank Tony for a speedy and efficient service. The whole process went very smoothly without any additional worry or stress these situations can involve. The finish on my car was perfect and I was very happy with the results, and the cost for the quality of the work. I will certainly recommend Tony and Chips Away to any of my friends and colleagues. Fantastic service from Tony, car looks new. Would highly recommend him and the Chipsaway franchise. They look professional and he did a great job, especially as he managed to do it at my workplace with no problems at all. Happy happy bunny. Excellent all round service Tony Costello is a true processional and provides a service that is well priced and gives customer satisfaction. Tony Costello done a great job repairing the dent in my door. Very happy with the service and would recommend to all. Like most people my car is very close to my heart and when the front bumper got damaged I was devastated. Tony from ChipsAway did a fantastic job with no fuss, you wouldn’t know my car was ever damaged and a very nice guy as well. Tony turned up at the house at the agreed time. He was both friendly and helpful and did a good job. You would never know there had been paint damage it looks really good. The booking was made within 24 hours and the work was carried out a day later. Tony Costello made a quite difficult task look straight forward and the result is excellent. His good humour and kindness added to our satisfaction with the outcome. I had a number of scratches and dents in my vehicle and, after emailing photos to Tony at Chips Away, received an estimate for the repair. We agreed a date to carry out the work and Tony turned up bang on time. The work was carried out as agreed and the price exactly as estimated. The work carried out is of the highest standard ... Read more and, in my opinion, as good as any body shop repair. The car is now back to its original condition and the paintwork flawless. I would have no hesitation at all in recommending Tony Costello at Chips Away for work. Excellent service! From contacting Tony Costello online to getting the work done was easy. Tony is efficient and in my opinion does an excellent job. This is my second time using Chips Away and would do so again. Would recommend without a doubt. Efficient service, very pleased with the end result. It was really helpful to know when Tony would arrive so that I could plan the rest of the day. Would recommend. Highly recommended, great service and very professional - thanks Tony! Cannot recommend this service enough. Makes life so easy not having to take the car to a repair shop and leave it there. Tony is also a really nice guy and clearly enjoys his work which is reflected in the high standard of repair. The cost was also a lot less than I was expecting. Will definitely be using Tony again if the need arises. First time using chips away and would use again Tony Costello turned up straight to work clean tidy fast would use again. Great service, amazing quality and extremely good value. I got quoted 5 times by my dealer for the same work. Tony is brilliant!! I couldn't be more pleased with the service I received from Tony Costello an excellent repair to a very high standard and at a reasonable price. Thanks again Tony you get my vote. Excellent job by Tony Costello, as with any franchise, they are only as good as their operatives and Tony is clearly a true craftsman, so if you can get Tony, you definitely won’t be disappointed! Superb job. Tony Costello did a marvellous job - just like he said - As good as new! I would not hesitate to recommend him. Hello Tony. Many thanks for the excellent work you carried out on my car. I am having problems using trustpilot to write my recommendation, so I have written it below. Do hope that this is O.K. Minor dent in car door and wing. Quoted £2,500.00 to be repaired by a garage, charged a fraction of the cost by ChipsAway. Apart from a ... Read more saving of nearly £2000.00, the work was carried in a morning by Tony Costello, a very sociable man, who did an excellent job. Based on the results of the repair, I would highly recommend this company. I have never used this organisation before but now I cannot praise them enough.Following a minor accident their operative came to my home ,on time as arranged and did an outstanding job.He went over and above what he had said in his quote and was very polite and explained the whole system to me including the guarantee.Tony Costello ... Read more is an absolute legend and I would most certainly recommend him/company to all my friends.THANK YOU. Tony Costello has done a fabulous job for me. It was a difficult one and my car is as good as new. Would certainly recommend his skills. On time and left in showroom condition, I hope we shall not need them too often, but they will always be my first choice. Tony was excellent - he did a great job and was punctual, tidy, very pleasant and took a pride in his work. Highly recommended. Tony came to mend my car and was totally thorough and did an excellent job. I was very pleased and would highly recommend him. Excellent service, on time fantastic workmanship. Would definately have them back for any work I require. Tony’s service was exemplary from start to finish. His correspondence prior to the work being carried out and quotation were quick and efficient. On the day, Tony arrived early to accommodate my getting to work and he was polite and friendly. His work was perfect, you can not see any residue of an awful scratch and dent across two ... Read more panels. Tony was also kind enough to touch up some paint scuffs on my rear bumper. He really went over and above. I cannot recommend his service highly enough. Thank you! Tony was fantastic - quick, prompt, friendly, great communication. Car looks like new, I'm very impressed. Tony Costello (Ashford, Kent) performed a brilliant repair on my Volvo tailgate, would highly recommend or use in the future. Thanks to Tony Costello Canterbury area for an efficient and quality repair, punctual and on a very cold morning had all the kit to do an on site repair just as good as a body shop. Tony was very easy to get along with and made an excellent job of repairing 3 areas of damage on my car which now looks in showroom condition. Thanks Tony Costello. Everything is done perfect. Tony Costello did an excellent repair on an alloy wheel which I'd stupidly kerbed just over week ago. He was great to deal with, from getting the quote to completion of the work. Tony clearly takes a great deal of pride in what he does and I had immediate confidence that he'd treat my pride and joy as if it were his own car. Tony from Herne Bay in Kent repaired some deep scratches in our Metallic Red Mazda sports car. He was pleasant, reliable and very clear to deal with and the standard of his work was exemplary despite the difficult finish and colour match. I would unhesitatingly recommend him. Tony Costello repaired my van at short notice, the quality of repair was factory standard and completed within 2 hours at a place that was convenient to me. I run my own business and appreciate the attention to detail excellent communication skills and pride Tony takes in his work...Damaged your vehicle? this is a genuine ... Read more alternative to a body shop with none of the lengthy hassle that goes with it! Can’t recommend Tony highly enough! I had the misfortune to buy an ice scrapper that malfunctioned when needed most and left me with a Deep nasty scratch up the N/S roof Pilar. Having contacted a number of independent and main dealers I plumbed for ChipsAway. Not having used them before but having read the reviews of the majority of happy customers I accepted the ... Read more reasonable quote offered by Tony Castillo in Ashford Kent. At this point I have to say I was nervous, not really knowing what to expect or the quality of workmanship, but today Tony arrived and went straight to work. Within 2 hours the scratch had gone, so much so you would never know it was there. The colour match is perfect and what’s even better than that is the fact Tony came to me and I can use the car, wash and polish straight away. Extremely impressed with the professionalism and quality of work. I hope this is the first and last time I have to use ChipAway, but if I need a repair in the future you will be top of the list. Thank you Tony for the great job. I live in the Folkestone area and Tony came to make my car look beautiful! I'd scratched at the back and front and didn't expect too much to be honest, but I was amazed how fantastic it now looks. Like new. Tony's a really polite and considerate guy, turned up when he said and just worked really hard until he'd finished. Highly, highly recommended.